If you are looking for a cheap b&b or guest house for a couple of nights, there are plenty to be found in this Cornish seaside town. Whether you want a budget bed and breakfast on the seafront with family rooms or a budget establishment with a view of the harbour and docks a quick search online will find you what you need. Remember to book in advance to get the best deals and keep an eye out for offers in the run up to your trip to make the most of your money. Last minute deals can also be cheap but planning ahead is always recommended if affordable accommodation is one of your priorities. Most guest houses offer accommodation to suit a wide variety of needs, and whether you need family rooms, bed and breakfast, or a romantic honeymoon suite for your and your partner, the large number of friendly b&bs available in Falmouth mean that there is always something for everyone. Falmouth is a great location if you are an outdoors person. With plenty of cycle routes all around the town and surrounding area you can enjoy exploring the bridleways and trail paths for hours on end. If you’re more of a water lover, then why not take a boat trip out for a spot of fishing, explore the reef with a dive off the Gyllyngvase beach or simply have a picnic on the white sands and take in the view while the kids take out their body boards. 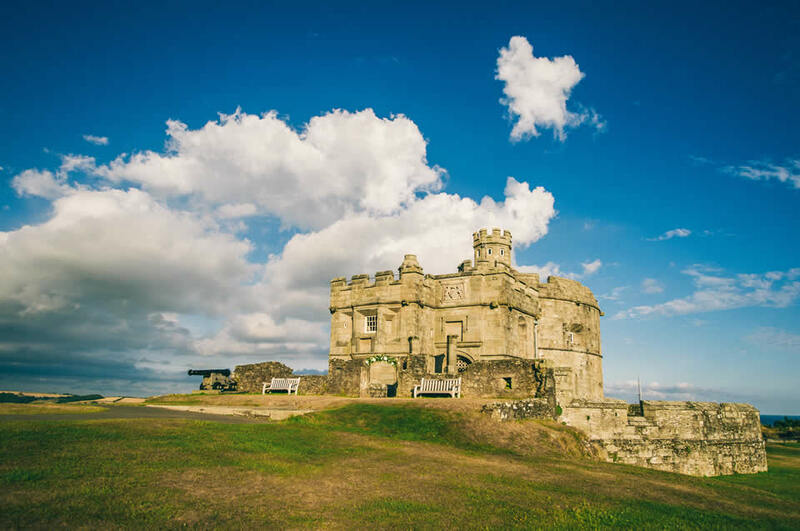 For history enthusiasts this town is home to Henry VIII’s impressive Pendennis and St.Mawes castles, while the Lifeboat and National Maritime Museum of Cornwall make for fascinating days out. For the perfect way to end the day, an evening stroll along the well maintained seafront promenade to soak in the atmosphere, marvel at the nature of the sea and feast on some of the country’s tastiest fresh fish and chips or hot Cornish pasties, is highly recommended. Falmouth is also the ideal location to base yourself if you are planning to visit further afield in Cornwall too. The picturesque town of St. Austell is less than an hour up the coast with its nearby Eden Project, Land’s End is just over an hour westward, while the famous Lizard Point is only 45 minutes south making for some fabulous days out in all directions. Most cheap b&b properties in town are family run and are within close distance of the beach. Some bed and breakfast offer spectacular sea views. A great breakfast to start the day is served each morning. Stay on a budget near the lovely sandy beaches of Castle Beach, Gyllyngvase Beach, Swanpool Beach or Maenporth Beach. Don’t forget check parking facilities when reserving your accommodation to allow for a stress-free arrival. The popular holiday town of Falmouth is situated in England’s most southern west county of Cornwall on the shore of some of the United Kingdom’s best beaches. With its docks, historic castles, natural harbour and its superb choice of guest houses, hotels and accommodation for all the family, this is a place people from all walks of life will enjoy. Staying in Falmouth is ideal from which to explore Cornwall’s famous attractions and beautiful coastline, such as Cornwall’s Roseland and Lizard peninsulas. Beyond Falmouth you will find Land’s End, and the Eden Project. Truro town centre, the Royal Cornwall Museum and Trelissick Gardens are all within 25 minutes drive. Penzance, St Ives (famous for its NYE festivities) and Newquay are all less than an hour away. Close to Newquay Cornwall Airport, Plymouth port and the railway station this town is accessible both nationally and internationally. If you are reaching the town by train, you have 3 options to get off. The town’s 3 railway stations are Penmere railway station, Falmouth Town railway station (near the centre) and Falmouth Docks train station (closest station to Pendennis Castle). There are frequent train services provided by CrossCountry trains and First Great Western to Cornwall. There is also a direct rail connection (also sleeper services) from Paddington station in central London (find b&b’s and guesthouses). The seaside town of Falmouth is located in the southern coast of Cornwall, in the south-west of England UK. Tourists and visitors flying to Falmouth arrive at Newquay Cornwall Airport NQY, approximately 30 miles from the town center. There a sheduled flights to this airport from airports across the United Kingsom and Europe. Lovely gardens which stretches down to the sea. Trebah was used as the starting point for the American and UK D-Day Landings. Interesting museum right next to the marina, displaying a range of marine artifacts and historic boats. Well worth a visit. Very interesting castle managed by English Heritage. The views across the bay and out to sea from the castle are stunning. Award winning Blue Flag beach south of the town center. There is on road parking, and a large car park nearby. It’s one of Falmouth’s four beaches. others are Castle Beach, nearby Swanpool and Maenporth Beach (both great for watersports). It’s a pretty harbour town on the River Fal, and a very popular holiday destination on the south coast of Cornwall. Beaches are perfect for sunbathing, watersports and romantic walks.